This is what is looks like upzipped. I found the tutorial for the Zip-itself coin purse at Craft Passion . My zipper was slightly longer than specified in the tutorial so I had to fold in the ends which made it a bit messier. I followed the link from Craft Passion to Haha Plaza, who sell these little purses and found they call them zipper dumpling coin purses. Is that not a cute name? Of course then I started wanting some ribbon to make another one and found this lovely shop Ribbons Galore. I may have ordered some ribbon from here, you'll just have to wait and see. Much more fun than cleaning the house. My daughter's school runs a Privilege programme, where if you behave yourself for the week or something like that, you get to do Privilege on Friday afternoons. There are a variety of options to choose from, ranging from Jump Jam to Origami. Anyway, the last school newsletter asked if any parents had skills they would like to share for Privilege, so I have offered to take a class making little felt toys if any of the kids are interested. 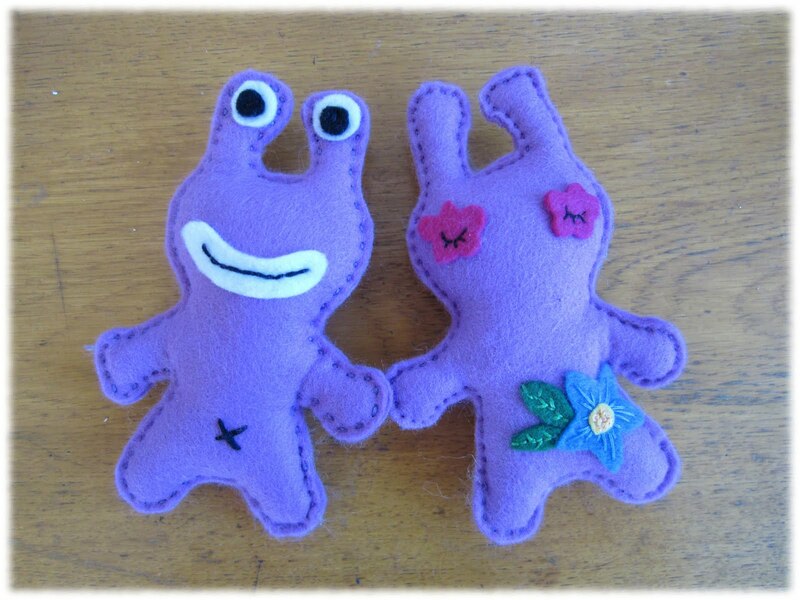 The monster on the left is one of the samples for the class, the pattern is from a Sew Hip issue 7 which I've shrunk it down. I was interested in an article in the latest New Scientist, Welcome to the 'algoworld', which is an interview with Kevin Slavin. Heres's link to a TED talk he gave in July "How algorithms shape our world"
Have you heard of the Live Below the Line campaign that is running this week. It aim is to raise awareness about the grim reality of global poverty home by asking young people to live for five days on $2.25 a day for food. That's the global extreme poverty line, where 1.4 billion people live every day. If you want to know more, then click here or here. There is a cookbook that could be handy, even if you're not doing the challenge. Today, my daughter and I have been to a Flowering Cupcakes class. We're very pleased with our efforts. And they taste yummy too. The class was at Strawberry Sky cakes in Pukekohe. Have you heard of Sugru? It looks quite handy. Another Sew Hip subscription gift that has sat around for far too long waiting to be made up. Today I'm reading about Camila Batmanghelidjh and Kids Company. Here's her take on the London riots. The kit was a subscription gift from Sew Hip, last year. I can't find it on the Clothkits website but there are lots of other gorgeous things so go and have a look. I have been trying out Linen Stitch and it's awesome. I'm using the left-overs from these socks and I love the way Linen Stitch blends the colours together, muting the brightness, and how it looks like a woven fabric (which probably explains the name).